Blogging from Home Online Workshop - Join Now! The Blogging from Home Online Workshop was designed to give interested learners an affordable and easy way to know the ins-and-outs of blogging. All lessons are kept simple and straight to the point for your convenience. 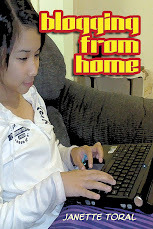 Blogging from Home book buyers and DigitalFilipino.com Club Members are given access to the site for free. Materials are mostly presented in text, video, and audio for a full learning experience. The following workshops shall be available and will be actively interacting to participants. We will be adding more in the weeks and months to come. Online workshop participants are encouraged to share their answers, thoughts, and post questions throughout the workshop. 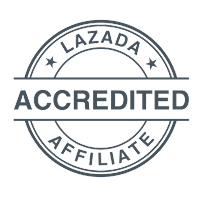 Those who gets to complete the requirements will also be sent a certificate attesting to the completion. I'm doing this project in collaboration with Buddy Gancenia who is in charge of all our multimedia production requirements. On page 42 of the book, Blogging from Home, I mentioned Performancing Metrics as one of the tools that you can use to track your blog performance. I warn you though that it can be very addictive due to its very user-friendly interface. Don't get me wrong, I love Google Analytics. However, there are features and presentation that Performancing Metrics does so well that makes it hard to just tie yourself up to one analytics tool. At a glance, Performancing Metrics gives you a snap shot on what you have in your website and be able to click right away and find out what is going on. If there are users viewing your site, it will also show you a number. This way, you don't have to wait for 24 hours to find out what has transpired at your site. The visitor log gives you an idea on the time, date, ip address, session actions, time, and referrer of every site visitor you had. The action log gives you a detailed activity of every visitor you had in your site. This includes the articles that they viewed, searches they made, among others. If you clicked on an article or post published in your site, it wil also show you the number of visitors it had for the span of time you've indicated. If you click on an IP address, it will give you more information about its location, operating system, browser, screen resolution used, and activities done in your site. If you click on a location, it will give you a detail on the number of visitors you had per location. If you clicked on a particular location, you will also see the date & time logs, IP address, session or actions, and how did they arrived at your site. It will show how many of your visitors came from searches, links, direct, bookmark, social media, e-mail, and RSS feeds. If you clicked on one traffic source, it will give you the full details on where those visitors came from. 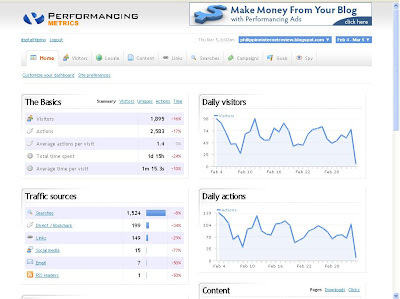 Each traffic source has a newest unique feature that gives a glimpse on your newest visitors or sources of traffic. I hope the above illustrations will be good enough to explain why I find Performancing Metrics to be useful. Try it out when you have time. On page 11 of the book, Blogging from Home, I pointed out the parts of a blog. Here is a video counterpart of the said page explaining the structure or anatomy of a blog. Blogging from Home book buyers and DigitalFilipino.com Club Members can join the Blogging from Home Online Workshop for free.